, common name for the family Berberidaceae, and specifically for the spiny barberries (Berberis species). The family includes perennial herbs and shrubs found in the Northern Hemisphere. The fruit is often a colorful, winter-persistent berry. ..... Click the link for more information. , class Magnoliopsida, order Solanales, family Solanaceae. The May apple is classified in the order Ranunculales, family Berberidaceae. 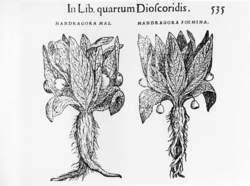 Male and female mandrake plants, from Book 4 of Dioscorides's Commentarii, 1544. Courtesy Fortean Picture Library. The Atropa mandragora, a member of the Solanaceae family (which includes such plants as the deadly nightshade and henbane). It is a plant whose roots grow naturally in the rough shape of a human being and, because of this, was once thought to have great magical properties. The American version of the Mandrake is the Podophyllum peltatum, but this is actually a different plant from the European variety. In the Middle Ages, a Mandrake would fetch a high price. Small slices of the root would be sold to sailors to protect them on their voyages. Pieces would be sold to place over the entrance of a house to protect the home from fire and intruders. Pieces would be placed under pillows to promote dreams and under mattresses (particularly those of infants) to protect from nightmares. A complete Mandrake root would command a high price, and the more it looked like a human being, the higher was that price. But since the plant grew wild, those who made money from selling Mandrakes circulated stories about the problems of trying to obtain one straight from the soil, to discourage others from simply helping themselves. Since the Mandrake root looked human, it was said that it was alive and to take it from the earth was to tear it from its home. It would, therefore, give a terrible scream when pulled up. That scream was so terrible that it would drive insane the person who had tried to take it, or even kill with its shriek. There was, then, a special way in which one obtained a Mandrake. Needed were a hunting horn, a length of rope, a hungry dog, and a piece of meat. The Mandrake was said to grow beneath a gibbet, feeding on the fat dripping from the hanged corpse. On the night of a full moon, the magician had to drop a noose of the rope over the Mandrake and then tie the other end to the dog's collar. He would then retire to a safe distance and throw down the piece of meat. The dog, being hungry, would lunge forward to get the meat, pulling on the rope and dragging the mandrake out of the soil. At that point the magician should blow loudly on the horn to drown out the sound of the plant's scream. The dog would hear the scream and drop dead, but the magician would have his mandrake! Knowing how much higher a price could be obtained for a Mandrake that really looked human, many magicians were not averse to modifying the plant as it grew. They would find a young Mandrake and carefully dig it up. Examining it, they would cut away small pieces to make it look more human, even carving a face into it if necessary. They would then place it back in the earth and let it grow for another month or so. Again, they would carefully dig it up and examine it. And again they might modify it before putting it back. By the time the Mandrake was fully grown, when dug up it looked as though it had grown naturally to look exactly like a human being, and so it could be sold for a very high price. In this way, also, a Mandrake could be made to look either male or female. Another story of the Mandrake was that it glowed in the dark. Certainly if one came across a Mandrake at night, it would seem to do that. According to Doreen Valiente, the reason was that its leaves attracted fireflies. These, hovering about the leaves, made it look as though the plant itself were glowing. Valiente also mentions that the plant had highly soporific powers and was used, in the early days of surgery, as an anesthetic. The Mandrake grew naturally in the Mediterranean area and was introduced to Britain in the fifteenth century, if not earlier. A good substitute often used was white or black bryony, a hedgerow plant (Bryonia alba) with a similar large, fleshy root. One of the common names for Mandrake in England was "love apple," since it was supposed to have aphrodisiac qualities. The Arabs, for this same reason, called it "devil's apple."